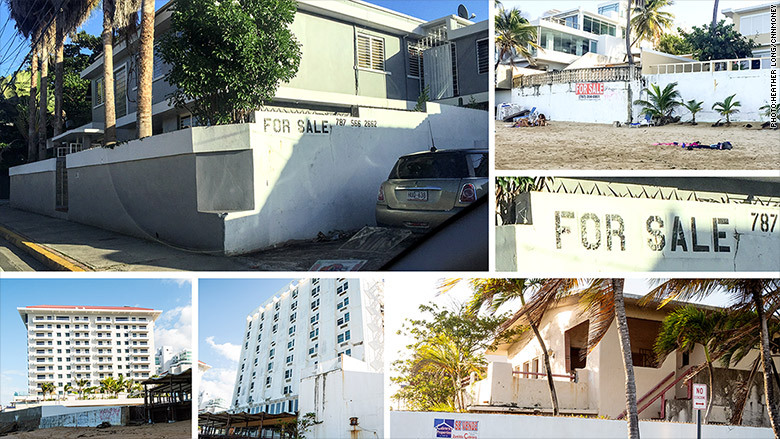 For sale signs and abandoned buildings are common in Puerto Rico these days. Looking for a real estate steal? Try Puerto Rico. While most of the U.S. freezes in February, Puerto Rico is 80 degrees. The island is home to one of the world's best beaches, according to TripAdvisor. And it's a buyer's market right now. You can get a 3-bedroom home near the beach for under $100,000. Hedge fund billionaire John Paulson has been scooping up real estate there. He predicts it will be the "next Miami." So what's the catch? For sale signs are everywhere in Puerto Rico. People are fleeing the island because it's been in a prolonged economic crisis. The situation is reminiscent of what Detroit was like when it filed for bankruptcy in 2013. "So many houses are empty here," says Joaquin Garcia de la Noceda, a locksmith in San Juan, the island's capital. Joaquin listed his 96-year-old mother's home in San Juan for $100,000. Hardly anyone looks at it even though it's in San Juan and has three bedrooms and two bathrooms. The home is one of many bargains in Puerto Rico. It was appraised at $215,000 not long ago, and his mom paid $177,000 for it in 2009. Few want to buy with the island in crisis mode. More than 1 in 10 people can't find jobs and the government is deep in debt. Since Puerto Ricans are U.S. citizens, many are simply packing up and moving to Florida, Texas and other states. The island has lost over 10% of its population -- roughly 440,000 people -- in the past decade. The exodus appears to be accelerating since the island defaulted for the first time ever in August. "People are literally leaving their homes empty with the keys in the house," says retiree Maria Milagros Rodriquez. They let the bank deal with it. Maria owns a gated home in San Juan with 5 bedrooms, a pool and a big garage. Homes on her block sold for over $1 million only a few years ago. Now people are lucky to get $400,000. 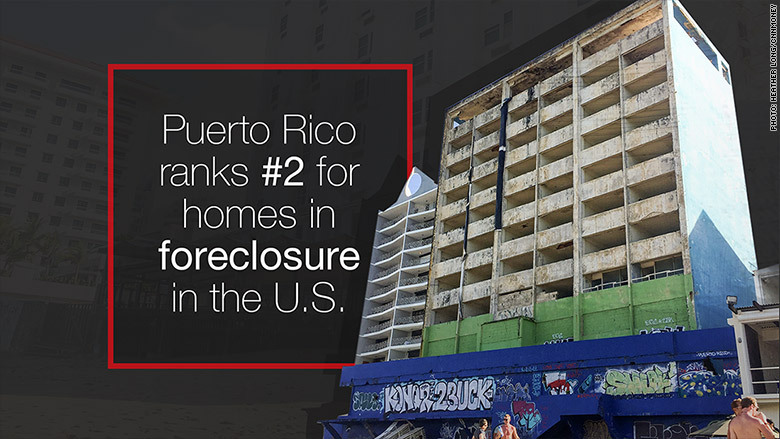 If Puerto Rico were a state, it would currently rank second in the U.S. for homes in foreclosure, according to RealtyTrac. It only lags behind New Jersey. The plight is evident on Maria's block. The home next to hers is empty and she knows of two other vacant properties a few houses down. There are no "for sale" signs yet because most of the homes are in the process of being repossessed by their banks. Puerto Rico has more foreclosures now than the national average at the peak of the housing crisis in 2010, says Daren Blomquist, vice president at RealtyTrac. And it's only likely to get worse. More and more homes are entering the foreclosure process. It's another blow as the the island tries to deal with its recession and $70 billion in debt. The "beachfront bargains" are starting to attract buyers. Paulson isn't the only one looking for deals. Wealthy investor Nicholas Prouty bought an apartment building out of bankruptcy in 2012. People warned him it would take a decade to sell the condos. He's already sold all 312 apartments. Who's buying them? He told CNNMoney the typical purchaser is a single Puerto Rican woman in her early 30s with a graduate degree. They pay $160,000 for a one-bedroom and $230,000 for a 3-bedroom. The apartment building -- known as Ciudadela -- is located in the heart of San Juan and has its own security force and private trash collection. The project has been so successful that Prouty is working on two more buildings. "The prices are excellent on real estate here," says Prouty, who has even re-located his own family from Greenwich, Connecticut to Puerto Rico.